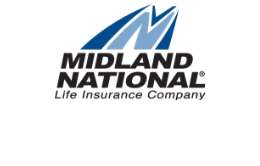 Since 1906, Midland National Life Insurance Company has been protecting families and preserving legacies for more than 110 years. Midland National and Sammons Financial Group have made a "Our Company History" brochure that you can download and view as a PDF by clicking here. For more information about Midland National, visit the Midland National Member Company page. To stay up on the very latest from Midland National, visit us around the web. Find the Midland National Company Profile on SammonsFinancialGroup.com. Get in touch with Midland National at our 'contact us' form. On Facebook? "Like" Midland National's Facebook Company page. Watch the latest videos on the Midland National YouTube Channel. Keep current with Midland National news on the Midland National Linkedin Company page. Midland National is also on Twitter. Find and follow the company @MidlandNatl. Add Midland National to one of your circles or communities on Google+. Connect with Midland National on Nationbuilder. Keep current with company happenings on Midland National News. Learn about the company's pedigree of service and quality on the Trust Midland National page.